Julia Leach tucked Joan Didion’s Slouching Towards Bethlehem in her Chance event gift bags and after reading the first two stories, I went on a bit of a Didion binge and bought The Year of Magical Thinking, Play it as it Lays and The White Album. Evening by Susan Minot. The movie did this wonderful book a great injustice and deserves a re-read. Mohawk by Richard Russo. One of my favorite authors and I have read all of his books except his first. I will this summer. Grace Coddington’s new book looks very nice. 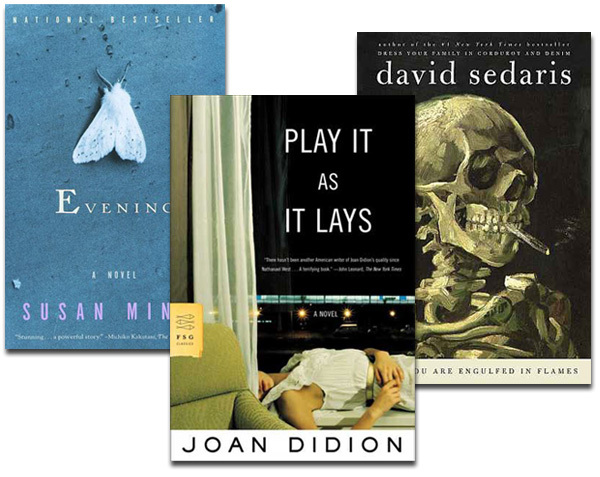 Excellent choices – I love Joan Didion and David Sedaris – and need to get my summer reading sorted. Thanks for some good suggestions. I went on a book buying binge just before my vacation last month, but I’ll definitely be adding Mohawk (love Richard Russo) and Evening, and maybe some others from your list, to my summer reading stack. If you’re a Joan Didion fan—-try ” We Tell Ourselves Stories In Order To Live “–collected nonfiction. Thank you for the suggestions! I loved ‘Maine’ last summer, but I, too, am having trouble finding more than just a few comparable beach/boat/car reading about which I can truly be excited. That said, Alex Witchel reviewed a novel in The Times, ‘Skios’ by Michael Frayn, that looks intriguing. Jane Hitchcock Stanton wrote the book ‘Social Crimes’ over ten years ago, and it remains my all-time favorite summer read. Her books are witty, easy, Madison-Avenue-thrillers. I am also looking forward to the novel ‘A Paris Wife,’ and possibly reading the non-fiction biography of Lois Moran, who is rumored to have been Fitzgerald’s inspiration for the character Rosemary in ‘Tender is the Night’. Happy summer reading! OMG! It is like you understand my mind! You seem to know a lot about this, like you wrote the book in it or soetmhing. I think that you could do with some pics to drive the message home a bit, besides that, this is good blog post. A great read. I’ll certainly be back. Wishing you Happy New Year!